Pastor Tim Parker became the pastor of Stewartstown Baptist Church in September of 2016. He spent 32 years in military service before retiring and transitioning to full-time ministry. Pastor Tim has served as an ordained deacon and two years as Interim Pastor in Missouri. Tim graduated from Liberty Baptist Theological Seminary with a Master of Divinity in Pastoral Preaching in 2013 and a Master of Theology (ThM) degree from Liberty School of Divinity in 2018. 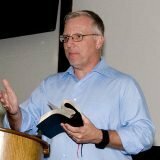 He is currently pursuing a Doctor of Ministry (DMin) degree from Southeastern Baptist Theological Seminary. Pastor Tim married Vernessa in 1988 and they have four children: Justin (Victoria); Stephen (Kristina); Chloe, and Caleb, and six grandkids. He loves family time, reading, and most everything outdoors. His passion is to see people come to have a personal relationship with Jesus Christ; making disciples who make disciples.